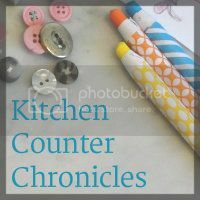 Today's guest post is from the very gracious Jen of Kitchen Counter Chronicles. I love how honest she is in her writing and I often see myself in her posts (she even has 2 girls like me!) which is one of the reasons I always enjoy my visits to her blog. Jen has lots of fun with her girls and she shares a lot of it on Kitchen Counter Chronicles. A few of my favorite posts are her recent Summer Solstice Stamping, Rainbow Cookies and their DIY Wind Vane. Hi all! I'm Jen from over at Kitchen Counter Chronicles. I am so thrilled to be guest posting over here on Mom to 2 Posh Lil Divas today. I can't wait to share our icy learning adventure! Summer is officially here and so is the heat. What better time to bring out the ice play. Actually, the idea for this activity was born way back in February. My youngest daughter's birthday was in February and her heart was set on having a sledding party. The only problem was that we had a very little snow in February. My back-up plan was to turn the sledding party into an ice party. Fortunately, the snow arrived in the nick of time. Unfortunately, this meant I had a freezer filled with icy toy filled balls. We used a few ice balls to decorate at the party and I also decided to keep a few in the freezer for icy summer play. So, back in February we filled balloons with 1 small toy and water. We then put the filled balloons in the freezer. The other day, we pulled them out. The great thing about these balls is how my daughter was able to observe a few amazing scientific facts about ice. We took the ice ball into the backyard. Depending on which way she looked into the ice ball, the toy looked different sizes. When she looked directly at the toy, it looked normal. However, when she looked through the ice, the toy looked much larger. The ice worked like a magnifying glass...pretty cool. In order to melt the ice ball faster we decided to place the ice into a bowl filled with water. Before she dropped the ice into the bowl I asked my daughter to make a prediction...what will happen to the water level when we place the ice inside the bowl? Will it rise, fall or remain the same? She predicted that the level would rise...she was correct. A great illustration of how the water was displaced by the ice, thus the water level rose. Even after placing the ice into the water for a few minutes, it was still not melting fast enough. How could we speed up the melting process? Friction! I had my daughter rub her hands together and tell me what happened to the temperature of her palms. After rubbing for a few seconds her palms became warm. Hmmm. She decided to try rubbing the ice to see if she could use friction to melt the ice. Guess what it worked! After just a few minutes of rubbing the ice melted and released the toy! This simple activity was an incredible opportunity to teach some basic science. These are my favourite type of activities. It is always great when kids learn without even realizing that they are. Of course, the best part for my daughter was that she got to play with the little toy in the freezing cold water! An ideal way to cool off on a hot summer day. I can't wait until we pull out the next ice ball from the freezer. What will we do with that one? Jen is a stay-at-home mom with 2 creative and intelligent daughters. She loves to share their adventures on her blog Kitchen Counter Chronicles. Jen has a passion for outdoors to play and leading an eco-friendly lifestyle. They are always busy crafting, baking, gardening and finding fun ways to play and learn. This is an amazing idea and now I'm going to look out for toys that will fit. Thanks for sharing. Thanks for sharing this fun activity with us Jen! My girls love ice excavation and I love the scientific take on it you shared with us. What a fun way to learn a scientific concept. It's been so hot here, this would be a perfect activity for us! I need to remember to teach my boys to rub their hands together. We love ice play, but sometimes they hate how cold their hands get. Wonderful post with so many great teaching opportunities.